Lined with shops from Bucherer watches to Prada handbags, Bahnhofstrasse is the place to shop and to-be-seen-shopping. This tree-lined avenue leads from the train station to Lake Zurich. Browse department stores close to the station. Then on to more serious business and see if you can afford a Vuitton handbag or a Rolex watch. Bahnofstrasse's shop windows are one of the best top sights in Zurich. 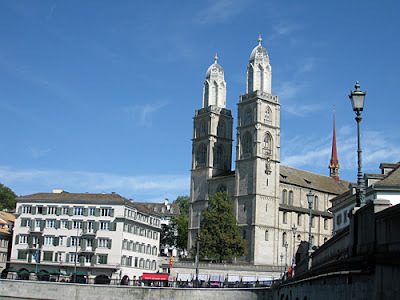 Münster Bridge offers sweepingviews of Zurich top sights: two churches: Grossmünster and Fraumünster, the tower of St Peter's Church and the facades of Rathaus and other imposing mansions look magical in the reflecting water of the Limmat River. Tram-packed Paradeplatz, off Bahnhofstrasse, is halfway between the lake and the station. This is Zurich's financial centre. Most Swiss banks have their headquarters here and in the streets leading off the square. These side streets are also home to designer boutiques and fashion houses. 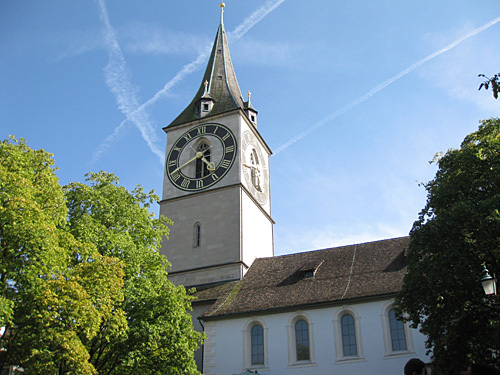 A top sight in Zurich is St Peter's Church with the biggest clock face in Europe, 9m (28.5 ft) in diameter and a minute hand of almost 4m (12 ft)in diameter. Look up at the short tower and the window. It was from here that town watchman looked out the window every fifteen minutes for fires. When he discovered one he would sound the alarm and hang out a flag from the window facing the fire. The cobbled street of Niederdorf, east of the Limmat River scream with history. This is the place to take an easy stroll during the day and party at night. It is a shoppers' paradise brimful with boutiques and quirky little shops hidden away in the maze of alleys. The street is jampacked with restaurants from gourmet eateries to traditional beer garden, from cheese fondu to geschnetzelte. Budget Places has 20 hotels available in Zurich.